Stand up for fun and a challenge on stand-up PWC from Kawasaki Jet Ski and Yamaha WaveRunner. 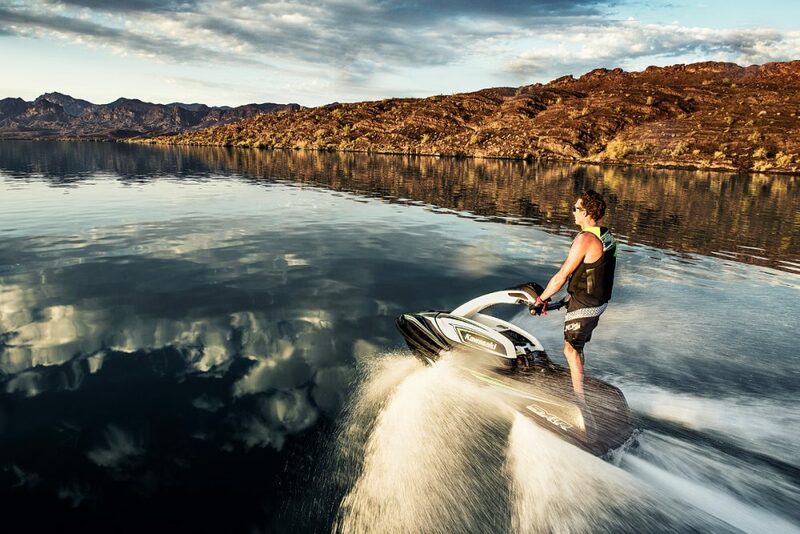 Stand-up personal watercraft like the Kawasaki Jet Ski SX-R and the Yamaha WaveRunner Super Jet will appeal to anyone looking for an engaging and athletic watersports activity. There was a time when you had to stand up to ride a personal watercraft. 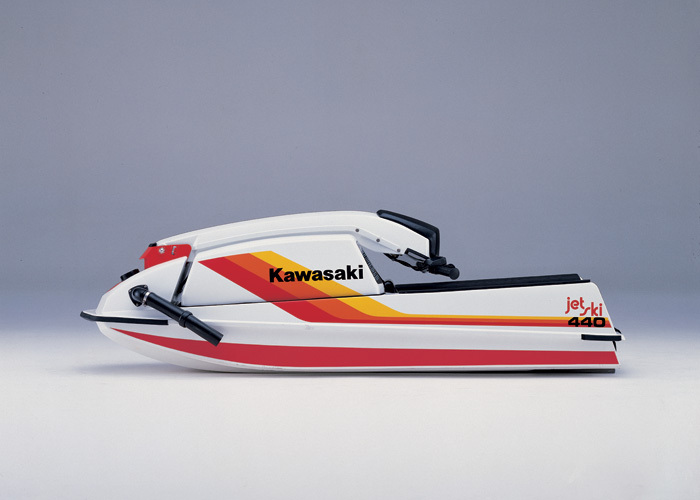 Tireless promotion by Kawasaki of its first production Jet Ski model, the JS400-A introduced in 1976, arguably invented the sport and until the advent of so-called “sit down” PWC from Yamaha (1986) and Sea-Doo (1988) the Jet Ski was the only way to ride. Or rather stand. The first Kawasaki Jet Ski was narrow and very challenging to ride. That’s what made it fun. 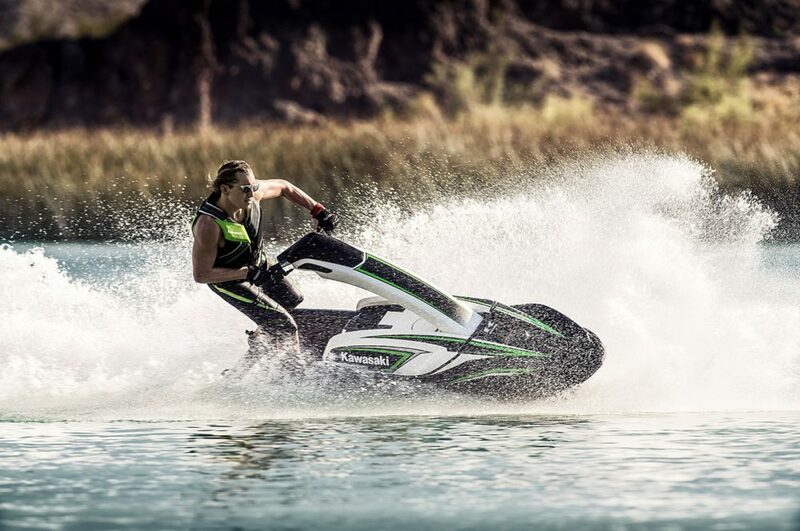 Kawasaki promotion of its early Jet Ski models started a new sport. 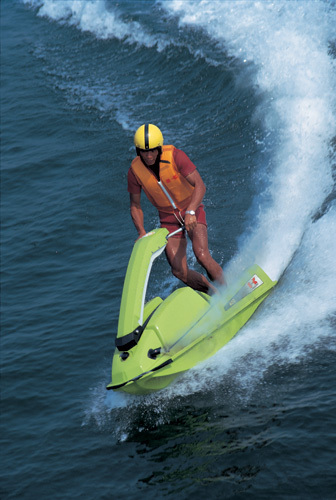 Those sit-down models changed the sport because, unlike the stand-up Jet Ski, they were easy to ride. A beginner could hop on and figure it out in a few minutes and start having fun. Learning to ride well on an early Jet Ski required real commitment; a lot of falling and swimming to get back on the craft. Modern sit-down models are even easier to enjoy; they are comfortable and powerful and full of convenience features. However, for many people that ease of operation also makes a sit-down PWC kind of boring. After riding around the lake for 20 minutes, what’s next? 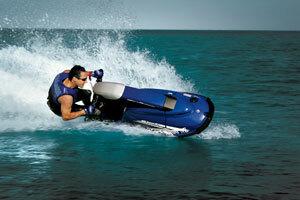 Current stand-ups, the Kawasaki Jet Ski SX-R and the Yamaha Super Jet, offer a much more engaging experience. These stand-ups are larger and more powerful, and thus easier to ride, than the early stand-up models, but they still come with a learning curve and require balance and some finesse to ride well. Like any challenging sport part of the fun of a stand-up is learning to ride the machine and getting better with every outing. The disadvantage of a stand-up is that its strictly a solo activity. Tubing or long-distance cruising are not options with a stand-up. And because it’s challenging to ride, the stand-up is not an ideal machine to share with inexperienced family members or lake-front guests. If you’d rather get away from those guests, however, a stand-up might be perfect. The WaveRunner Super Jet is very light and maneuverable, and challenging enough to keep riders entertained all season. There are currently two stand-up models offered by major manufacturers. 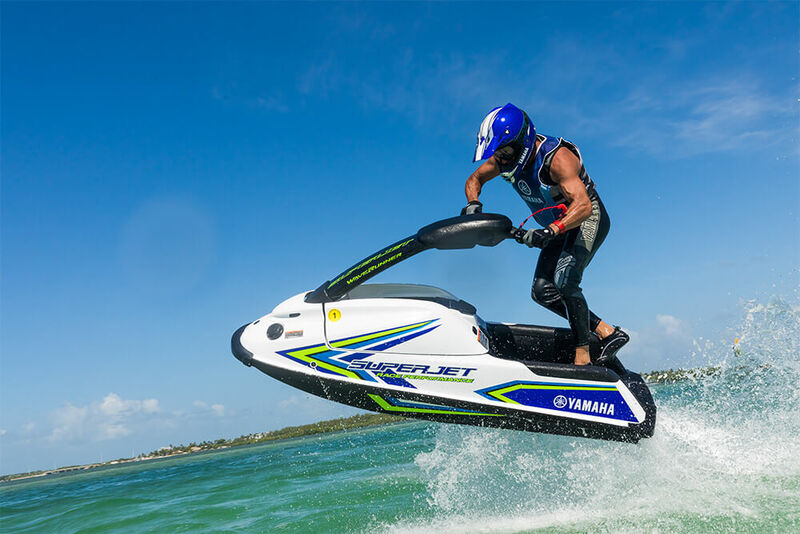 The Yamaha Super Jet ($8,499) is 7 feet 4 inches long and 2 feet 3 inches wide and weighs just 301 pounds. It’s powered by a 701cc two-stroke engine, and because that two-stroke engine does not comply with current emissions regulations, a new Super Jet is “available for closed course competition use only.” Yamaha dealers are restricted to selling a new Super Jet only to racers. You need to show that you are a IJSBA-licensed racer to buy a Super Jet. If you’re not, many dealers will help you become an IJSBA member. The fee is $65. Because it’s sold for competition use the Super Jet also does not have a Yamaha warranty. Longer and wider than previous Jet Ski models, the new SX-R is also easier for a beginner to ride, but still has the power and agility to entertain an experienced stand-up pilot. The Kawasaki SX-R ($9,999) was re-introduced for the 2017 model year after a five-year hiatus. This all-new SX-R is much larger than previous Jet Ski 800 SX-R stand-up or the Super Jet, at 8 feet 9 inches long, 2 feet 6 inches wide and 551 pounds. It needs to be that big to accommodate its 1.5-liter four-stroke engine, a work-horse of the Jet Ski line and fully emissions compliant. While more challenging to ride than a sit-down PWC, the new SX-R is much more stable than previous stand-up models and thus also easier for a beginner to ride. It’s still a machine that will keep you engaged all season, however, as you learn to cut sharp turns, slide the hull and ride in choppy water. A pre-owned stand-up is always an option. You might find a trade-in available from a dealer, which we’d expect to be serviced and inspected and ready to ride for a fraction of the cost of a new model. When buying from the private market look for a late-model example that shows little use and has minimal modifications, especially to the engine. This can be a challenge because many stand-up PWC really are raced or owned by enthusiasts who like to add “go-fast” parts that can negatively impact reliability. 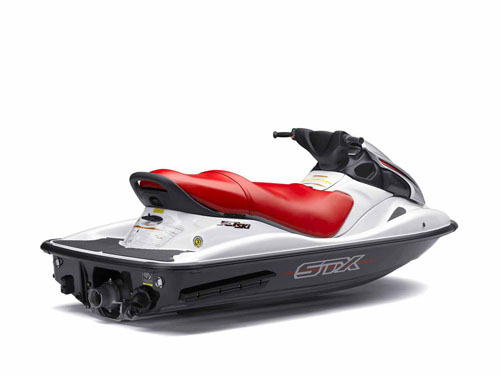 Late-model Super Jet and Jet Ski SX-R craft are very reliable and durable in their stock configuration. The Super Jet has not been refreshed since 2008, so except for cosmetics examples back to that model year the same as a new one. If that pre-owned craft comes with a trailer that’s a bonus, as you’ll need a way to move it around and store it. Neoprene shorts or a PWC-style wetsuit, or at least neoprene lined PWC trunks, are a good choice for stand-up riding, and of course you’ll need a Type III vest-style life jacket that fits properly. Time Running Out On Stand-Up PWC?